Challenge yourself to become a China expert! Celebrating its 4th anniversary this year, the KU-China Global Leadership Program has supported its participants in growing as China experts. 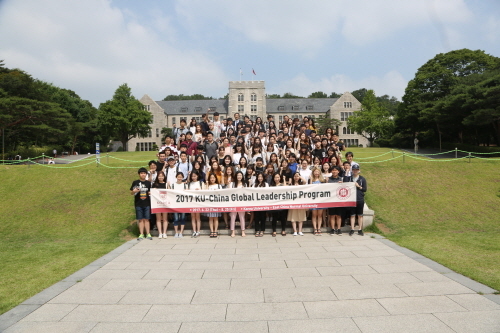 On June 22, 9:30 am, the commencement ceremony for the KU-China Global Leadership Program (KUCGL) took place in the Centennial Memorial Samsung Hall, Korea University. Celebrating its 4th anniversary, the KUCGL program is a basic course open to anyone intent on becoming an expert on China regardless of Chinese language ability. Program participants take a 4-week Chinese language course on campus during the summer vacation and then proceed to China for another four weeks to take locally customized education courses. Courses in China consist of a language course and a variety of activities such as cultural experience programs and corporate visits. The number of participants has almost doubled compared to its nascent stages when the program had only 53 students. In addition, the program has become the foundational model of the KU-Global Leadership Program, which currently also supports students in studying in Japan and Latin America. The KUCGL program started in 2013 with the aim of nurturing China experts. Due to donations from KU alumni and others, the university raised a total 800 million won for the program. Participants are financially supported with education expenses, airfare, boarding expenses and cultural experience program fees. 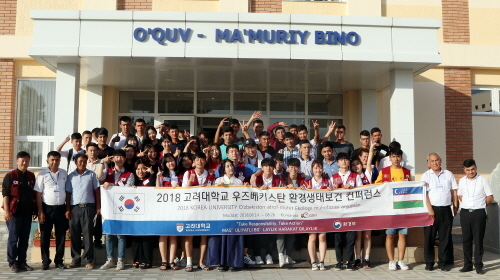 After completing the Chinese language course at Korea University, participants then take classes at East China Normal University. In 2013, when the program first began, the partner university was Renmin University of China in Beijing. Since 2014, the program has been in partnership with East China Normal University (ECNU). The university, well known for its focus on teaching Chinese as a foreign language, has been very helpful with running the program and providing practical support to program participants in their second language acquisition. 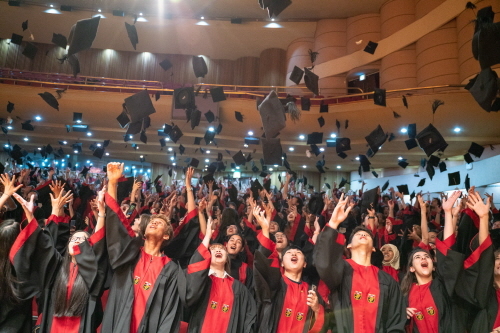 In addition, ECNU, active in academic exchanges with other schools abroad, not only has a great student management system but is also always willing to exercise flexibility in offering customized education services to its partner universities, including Korea University. To become a regional expert, the most basic knowledge one should have is language capability itself. Accordingly, the KUCGL program is mainly composed of language classes. Once the program begins, participants spend most of their days studying Chinese through classes and self-study. During the first four weeks in Korea, class instructors record the characteristics and learning progress of each student and share that information with ECNU instructors to enhance educational efficiency. To maximize the benefits that students derive from the program, a representative of the KU instructors visits ECNU during the first four weeks for in-depth meetings with ECNU instructors about class management. This ensures that the KUCGL program is based on close cooperation between the two universities as they strive to engage students as much as possible in their Chinese learning process and help them to the end of the program. ▲ On June 15, KU students from the KUCGL program visited a Kookmin Bank (KB) branch at SK Tower in Chaoyang District, Beijing. They went behind one of the bank windows and learned up-close retail banking from a bank teller. ▲ KUCGL program participants on a field trip to Beijing Hyundai Motor Co., Ltd.
After four weeks of intensive language courses, students fly to China for the remaining four weeks. Courses provided in China are also focused on language, but students are also offered cultural experiences and corporate visits. As part of the program, they create their own portfolios showing their personal process of and progress in improving their capabilities. Creating those portfolios requires them to get out of their rooms and interview locals or plan various activities on their own. 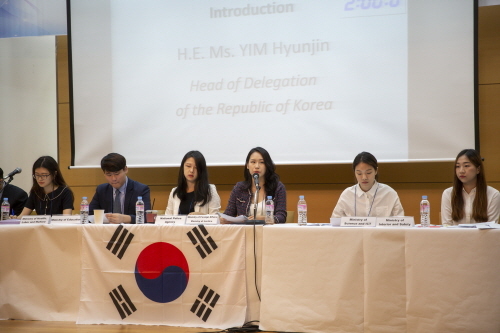 For instance, a nursing major who participated in the 3rd program did brief research on the differences between emergency rooms in Korea and China, based on her training experiences at Korea University Anam Hospital. This shows that, through the KUCGL program, students can achieve enhancement in many aspects, including language. Students who complete the KUCGL program in the summer with excellent performance may participate in the 4-week intensive course provided at the Harbin Institute of Technology in the winter. For the past four years, the KUCGL program has continued to develop based on its commitment to offering what students need and helping them through diverse approaches. For example, the summer course in China used to select one or two well-known companies for the corporate visit event in the past, but these days the program takes the students’ majors into consideration when selecting companies befitting their field of interest. The student selection process itself has become stricter than before. In the past, anyone selected for the program was allowed to participate in all of the courses, but presently only those who participate in classes with passion and diligence are accepted for the second part of the program. Unchanged, however, is the principle that anyone performing well in every course is welcome to join the ECNU course. Getting employed at a firm is not the only career option these days. In fact, a growing number of participants have start-up companies as the theme of their portfolios. In China, which has the world’s largest population, huge success is possible with the right product or service to attract Chinese customers. It is said that if a foreigner tries to start a new business in China, the Chinese feel closer and more comfortable with those who have at least a basic ability in Chinese compared to those who speak English only. For a successful start-up in the Chinese market, learning to speak their language is essential. 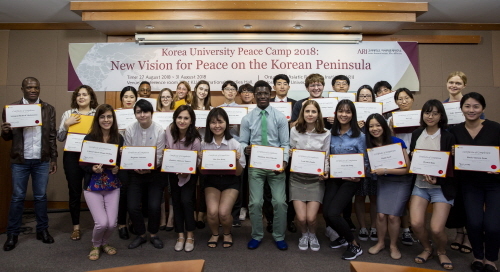 At the ceremony, KU President Jaeho Yeom stressed the significance of pioneering intellectuals: “We no should longer be passive intellectuals obsessed with grades or academic background. Instead, we should seek to become pioneering intellectuals who find solutions for complex and difficult tasks by fully wielding autonomy and taking responsibility”. Discovering new opportunities in other countries and trying hard to get the best result is the goal of the KU Global Leadership Program. The program has expanded its realm beyond China to Japan and Latin America. For those interested in these regions, the program offers the best opportunity to realize their ambition. The KU Global Leadership Program will nourish those who have the potential to become leaders of the next generation.